Please read the 2D Barcode FMX Components User Manual (Download PDF file). 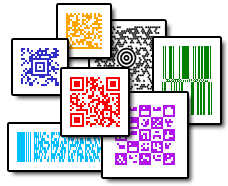 You can use print method to print barcode symbols to paper directly. Or use the Draw method to draw the symbols to any TCanvas object. Its fore- and background colors and transparency can be changed free. The barcode symbol can be scale or rotate free. Structured append, ECIs etc are supported. The components package support most popular matrix and stacked 2-dimensional barcode symbologies, including PDF417, MicroPDF417, QR Code, Micro QR Code, DataMatrix (ECC 000-140, ECC 200), MaxiCode, Code 16K, Aztec Code, RSS-14, RSS-14 Truncated, RSS-14 Stacked, RSS-14 Stacked Omnidirectional, RSS Limited, RSS Expanded, RSS Expanded Stacked, and Aztec Runes. etc. Click here to find all the barcode symbologies supported by the components package. The LiveBindings is supported by all of 2D barcode components, and they have the ability to read the value of a field from a database table or query, then display that value as barcode symbol in the canva, or print the barcode symbol to paper. Both binary and text fields are supported. Also, you can customize the encoding scheme. You can save the barcode symbol in variety of picture formats, including the vector image format and pixel image format. Pixel image formats: Including the .Png, .Gif, .Jpg, and .Bmp. Vector image formats: Including the .Svg, .Eps, .Emf, and .Wmf. Also, you can copy a barcode symbol to clipboard.